Kota Kinabalu: Cosmopoint culinary student Gary Gidioen Peter Nicolas who invested only RM80 to prepare himself for the '2012 God of Cookery, Home Category' competition, was well rewarded after he won the competition and returned home with a RM1,700 cash bounty. "I only prepared a few things for the competition and I didn't expect to win. I had only one week to practice but today I'm proud to be the winner" he said after receiving his prizes from one of the judges, Chef Johan Sinam. Apart from the cash prize, a Papar-born also recieved a Petronas gas cylinder and other goodies from the sponsors. The second spot went to Mohd Hafiz Awang Mohd Su'ud who won a cash prize of RM800, a Petronas gas cylinder and goodies from the organizers, while Isnin Shah was placed third and also won a RM300 cash prize, a Petronas gas cylinder and goodies. 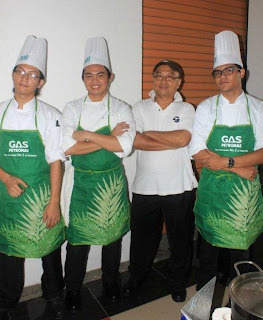 It is divided into two categories, namely for cooks and chefs, which have 20 and 16 participants will vie for the top prize of RM3,500 cash, a trophy and cooking products from sponsors. The judges for the competition besides Johan are Chef Danny Hamzah, nancy Lim and Clare Celementina Johan. Tourism, Culture and Environment Minister Datuk Masidi Manjun will attend the final day of the competition today since the event is supported and endorsed by ministry. The main organizer, Zee Tech, has also lined up several competitions for the public with prizes to be won.